The Poetry Caravan of Columbia County is an off-shoot of the “original” Poetry Caravan which had its beginning in 2003 in Westchester County, and has been operating continually since. The Caravan consists of a group of poets, all volunteers, who bring poetry (their own and others’) to audiences for whom poetry may not easily be available. At each scheduled program, two or more poets read poems appropriate to the audience. Participation by attendees is encouraged, since visits are not “performances”; rather they are the sharing of poetry. The Poetry Caravan of Columbia County began readings at Camphill Ghent in March 2015. We are exploring other venues for one-time or regularly scheduled readings. The Chatham Public Library is our sponsoring partner. New members are welcome! We bring you poetry wherever you are! We read a selection of our own work, classical and contemporary poetry, thematically suited to your occasion, like to accommodate requests and interact with the audience. Children need poetry, elders need poetry, the ailing and convalescing, the inmates and outcasts; everyone needs poetry! 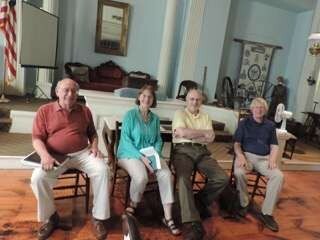 The Poetry ﻿Caravan of Columbia County is a free cooperation of local poets. They have in common that they love poetry and read varied texts, that they write their own poems, AND that they wish to carry poetry to places where it otherwise might not live, sharing their enthusiasm and conviction that poetry, like music, can unite people, be medicine to the heart and nourishment for the spirit. n. 1. The art of apprehending and interpreting ideas by the faculty of imagination; the art of idealizing in thought and in expression. In music, instruments, and poetry".